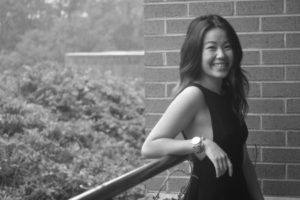 Julie Le was born and raised in Charlotte, North Carolina. She grew up in a household that instilled a love for travel at a young age. Fashion has always been on Julie’s mind and she finds inspiration through her travels along with the people she meets. While in high school she attended the Summer Textile Exploration Program at North Carolina State University and has never looked back. Julie loves designing ready to wear fashions that promote confidence and beauty to those who wear her garments. After graduation Julie plans to pursue a career in either product development or technical design. Collection: Dalliance is defined as a love affair. Menswear silhouettes and design details inspire this spring collection. The woman who wears Dalliance is confident and passionate; she treats her life as if it is a great affair. She pursues what her heart and mind is invested in whether it be love, a career, or both.